Every month, I publish a newsletter (in Dutch), in which I summarize that month’s online news about ancient history. One of the discoveries I made, was that of the archaeological press releases, about 40-45% contains serious inaccuracies, mostly exaggerations. Probably, I am naïve, because people I tell about this, usually say something like “we already know that” – and indeed, some have already published about the unreliability of archaeologists (example). It seems that archaeologists have a serious image problem, and I am not the first one to point at it. They are not the only ones. About a year ago, virologists warned us that the outbreak of swine flu would be absolutely catastrophic. As it turned out, nothing serious happened. A bit later, climatologists lost a lot of their credibility when it was discovered that some of them had been “improving” their results a bit. Or, to take an example from the study of Antiquity again: as the readers of the postscript to my book on common errors will know, among the greatest sources of disinformation are people who have a Ph.D.
What I am stressing is not that our academicians are corrupt, but that they are rapidly losing credibility. That is sad, because the great majority of them are still trying to find the truth. So, I would have expected that our academicians would do everything to regain our respect. Regain trust with interesting results. The last thing our universities need, is publicity that reinforces the image that they’re not seriously interested in science and scholarship. But this is exactly what happens. At least in Leiden. 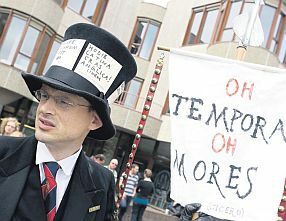 Last week, some fifty students, several scholars, and a former rector magnificus, organized a demonstration – not about some serious issue, but against a proposal to abolish the Latin language from the university’s diplomas. I was reminded of the famous story by Edgar Allan Poe, “The Mask of the Red Death”: people celebrating a party, ignoring the disaster that is about to strike. Or you may compare it to the man who complained about the ice cubes in his whisky when the Titanic was about to go down. Until now, I had a feeling that the university still might rejuvenate itself, because I was convinced that there were still people seriously interested in the quest for truth. Now I’m not so sure any more. That serious scholars concentrate on silly things like these, and ignore cleansing Augeas’ stables, leaves me with the impression that, after all, my faith in our academicians’ integrity was naïve. They’re more interested in frivolity. This entry was posted on Wednesday, June 9th, 2010 at 7:14 pm and is filed under Classics, historical theory. You can follow any responses to this entry through the RSS 2.0 feed. You can leave a response, or trackback from your own site.